When you think of training for soccer, you probably don't think of using a treadmill. A treadmill can provide an indoor alternative training workout to improve your soccer performance. You can increase your endurance, your speed, your sideways movement and your acceleration through using a treadmill and specific training techniques. These adaptations carry over into your soccer game and may result in you being first to the ball. Throughout a soccer game, you spend most of your time running. You can increase your endurance performance by running on a treadmill three times a week, at a set speed, for one hour. As your training progresses, set a weekly goal of increasing the distance covered within that hour. You will need to increase your speed slightly in order to reach a greater distance. You can practice sprint during your treadmill workouts. Interval training has been shown to improve soccer performance and increase the distance covered. "Medicine and Science in Sports and Exercise" published the results of a study conducted at the Norwegian University of Science and Technology on male junior soccer players. Twice a week, the soccer players performed four sets of a four-minute run at 90 to 95 percent of their maximum heart rate, followed by a three-minute recovery jog. An example would be to run at seven miles per hour for four minutes, followed by a five mile per hour recovery jog. 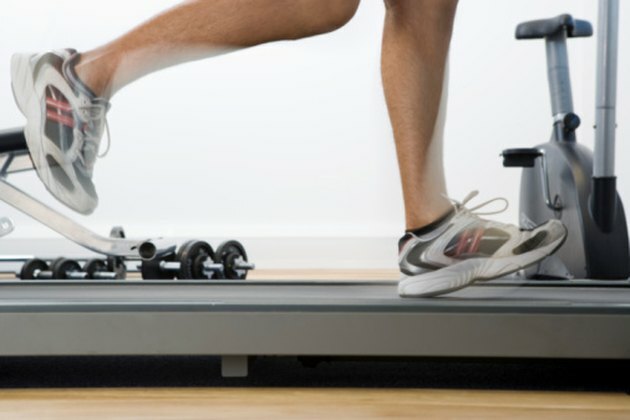 The amount of time it takes you to increase your run to maximum speed can be decreased through the use of a treadmill. After a five minute treadmill warm-up, begin running at a comfortable pace. During your run, quickly increase the speed on the treadmill to the point where you cannot run any faster. Immediately reduce the speed to your workout pace. After two-and-a-half minutes, accelerate again. Repeat the sequence for a total of six times. Soccer places many movement demands on your body. You may spend a portion of the game running sideways. You can practice this motion on your treadmill. Begin at a low speed, such as one-and-a-half to two miles per hour. Practice a shuffle motion in which your front foot steps forward and your back foot hops up to meet the front foot. Do not cross your feet over each other. As your comfort level improves, increase the speed. Practice an equal amount of time, such as 15 minutes, on each side for even development.